Given the rumors, reports and generally predictable release patterns of flagship smartphones, it's likely we'll be furnished with Google's third-gen Pixel handsets sometime during the early fall. 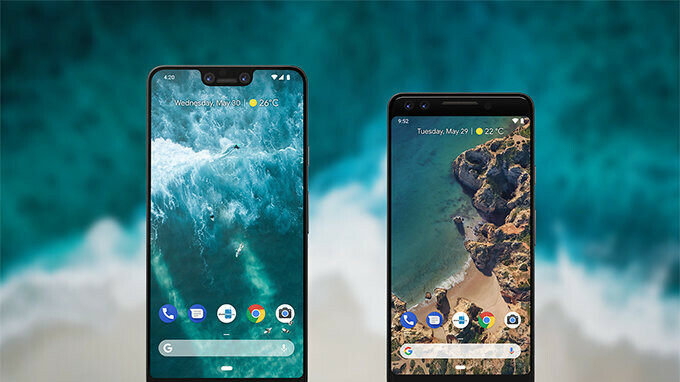 What began as the Pixel and Pixel XL in 2016 was bumped to the Pixel 2 and Pixel 2 XL last year and naturally, the next-in-line models are being dubbed the Pixel 3 and Pixel 3 XL. Where the name probably won't change all that much, we've been hearing of numerous purported design tweaks, particularly with regards to the larger, XL variant. Now, a new case leak gives us something else to add to the mixing bowl. Reports suggest that the Pixel 3 XL will include a notch at the top, akin to the Apple iPhone X. Despite the practical merits, plenty of smartphone fans feel that it hinders the overall aesthetic, and so there's likely to be some resistence to Google's foremost handset following Apple's major-market lead. 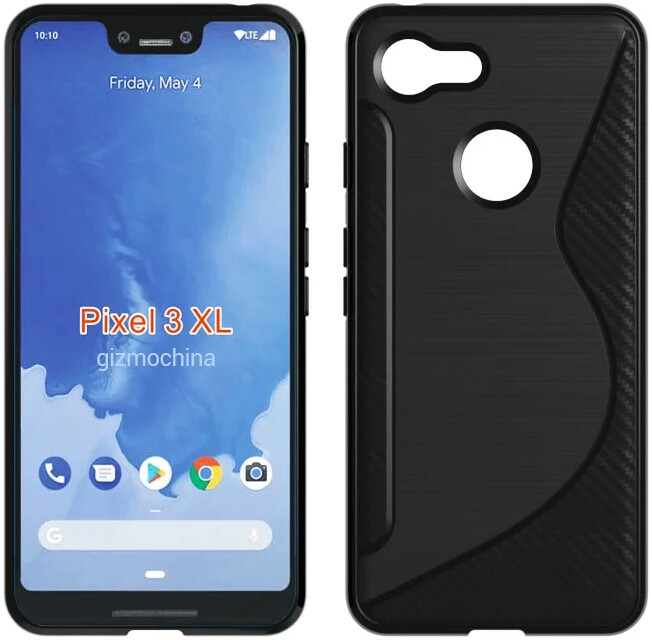 The latest case leak aligns with the notion that the Pixel 3 XL's notch will facilitate a dual-front-facing camera setup. The arrangement of two sensors in close proximity has been implemented by several manufacturers over the past few years, though for the most part, we've seen the likes of the Samsung Galaxy Note 8 and Apple iPhone X enjoy dual cameras on the rear, rather than the front. There are numerous theories as to how the dual-sensor system may be utilized with the Pixel 3 XL, with suggestions ranging from improved depth-of-field snaps to advanced facial unlocking. Given that we find ourselves very much in the midst of the Selfie Generation, one can already envision TV ads proclaiming the Pixel 3 XL and its self-snap wizardry as the best thing since sliced bread. Whatever the case, the shooters of the Pixel 2 and Pixel 2 XL are impressive front-to-back, so if Google does plan to take the dual-front-camera route, here's hoping the Big G doesn't rock the boat in a negative way. The render within the new case leak shows dual front-facing lenses either side of the earpiece and a 'chin' beneath the display for the speaker. 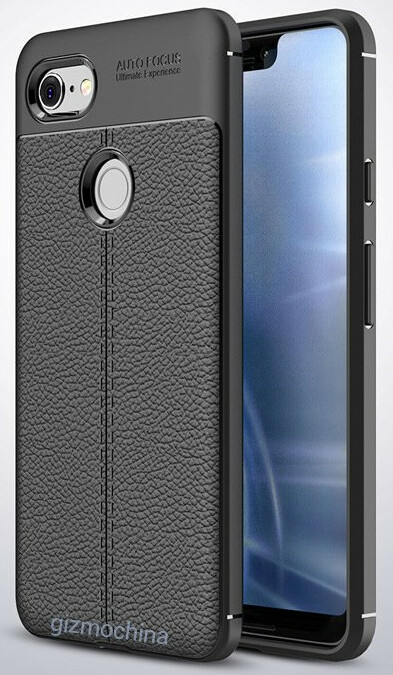 To the rear, meanwhile, this leak indicates that there will be just a single camera lens and flash. The decision to go for two cameras on the front -- rather than the back like a number of other manufacturers -- is a slightly curious one. Perhaps Google simply wants to differentiate itself from Samsung, Apple et al. With competition being so fierce at the top end of the smartphone market, it can often be the tiny details that sway consumers one way or the other, and if the dual-selfie camera presents a convincing argument, the search giant could potentially snare a few would-be iPhone or Galaxy owners. Should Google's Pixel 3 XL prove a sucess with its dual front cameras, it's then likely that subsequent models will get similar treatment with the rear snapper(s). After all, to essentially overhaul both the front and rear cameras would be quite a workload for a single generation, and adding so many shiny new features in one hit would possibly increase the chances of something going wrong at launch. Still, fans can be reasonably hopeful that an eventual Pixel 4 XL will sport dual cameras on both front and back. Given that the original Pixel models were announced on October 4th, 2016 and the Pixel 2 series was unveiled on October 4th, 2017, we should expect Google to showcase the Pixel 3 and Pixel 3 XL on Thursday, October 4th 2018 if it wishes to retain tradition. If so, shipments of the new devices should begin a couple of weeks later, on or around October 19th. Are you looking forward to the Pixel 3 series? Let us know in the comments below. I will get the regular pixel 3. Same here. Gotta be able to one hand a phone. Same here. Thinking about retiring my Moto X 2014 and getting Pixel 3 this year. The chin on the XL is crazy. Why so big? Of course it's released on October 4. 10-4 is the standard response to an acknowledgement. That Wall-E looking notch is creepy. Definitely the ugliest notch, if not phone for this year. It's funny, because the notch is the first thing I noticed when the device leaks began. All of these Pixel 3 XL leaks, even the more credible CAD renders, all show a device with very prominent lenses on both front facing cameras. It just looks silly, so hopefully the final product is a bit more polished. I doubt it that it's gonne be any different than this. In recent years, Pixel phones were released without any changes from the pictures that were leaked months prior to their release dates. I love face ID for opening passwords on websites but I absolutely hate it for unlocking the phone. it is sooooo annoying to hold it to your face and if you have at wrong angle or wrong face expression, you have to enter stupid password. happens more frequently then not. so i am thinking about switching back to google/ android for the fingerprint scanner alone and frequent updates, so the Pixel 3 is my next ride for sure. I really hope the Pixel 3 will get that new 48 MP sensor, which releases a month before the Pixel launch. I want to get the Pixel 3 XL this fall to replace my Galaxy S7 edge but I'm not looking forward to having to stare at that tall notch every time I look at the phone. Why did Google have to copy that design flaw from Apple? Perhaps I should wait to see what the Pixel 4 is going to look like. I have the Pixel 2 and love it. Super fast and the monthly updates are like clockwork. Never had a phone that updated so regularly. Going to trade it in with the Google Buy Back program for the Pixel 3...looking forward to the same one-handed functionality with the new bigger screen rumored for the Pixel 3. Hopefuly this one will finally have some decent mics ... so you know you can call with a phone and record video. But wait, it has a notch? So who cares anyway. So, why does the second picture (side by side one) have a tiny notch at the top above the camera cut-out? I don't see the same notch elsewhere or in the other case leaks from today so I suspect something is wrong, but that doesn't make me stop hoping for the return of a headphone jack.